Today’s instant global connection on the worldwide web provides fascinating prospects for our children to do some truly deep, great work. In this new era, one of our goals could be to assist them to take advantage of this opportunity and as parents and teachers to guide them away from getting sucked into the mundane, seemingly important details of the pop culture, latest fashion trends and coolest cars for example. This, for our children, is the difference between being empowered by technology and being dependent on it. Just as with other disciplines in the context of Cosmic Education, the broader aim of our approach to technology is to help each child to reach his fullest potential. We want to foster the child’s sense of belonging to the world community and technology provides a key element to achieve that. We as adults must show how to access these tools with care to our children. We could model, guide and support the children which allows them to build the necessary skills they need to live as contributing members of society in our global digital world. These ideas may lead us to ask ourselves, what criteria do we use to decide whether a particular technology is appropriate for 6-12 year old child? As with any activity we are considering for the classroom, Montessori guides ask the following questions. How does the work support the natural development of the child? How does the work or idea support the child to develop independence in both action and thought? There is such a great variety in technology not only what is available but, also how its used that we cannot and should not consider all of it the same. We could ask ourselves, is this game, program or app fostering the child’s ability to think creatively? Does it provide opportunities to reason and collaborate? While accessing the World Wide Web, the child should be on collecting, analyzing, evaluating and using this medium as a tool to support and present his information. The most essential point to consider is how we engage with technology? This is especially true for the Montessori guide. We view the use of technology almost the same way we view how a material in the classroom is used. Different technologies might engage children in different ways at different levels. Similar to the approach we Montessori Guides use through our observations in the classroom before inviting the child to a new lesson. Instead of allowing our children to engage in a technology that consume information, largely passively we want to make sure the medium we’re choosing is one that provides opportunities to produce information which is a more active engagement with the technology and the content. For example, once there was a student in our classroom who was passionate about nature, saving the wild animals, especially animals that are under the endangered list. This passion to make a difference made this child get into action. So one day she started writing a letter. After many edits the letter was completed. Then she used the computer to type up the letter, make copies and finally it was ready to inform her neighbors about a bake sale / lemonade stand she’s setting up to make money to save the Sumatran Tigers. During this process, under supervision she was searching online to find an organization that is dedicated to save these endangered animals. Once she found the organization that spoke to her soul, she contacted one of the coordinators from the organization with valuable questions she needed for clarification. Once she was pleased, this girl had her bake sale and all the preceding went to a specific tiger. As a token of gratitude she was given a link to Hawahave 24 hour access via a live camera to view how her sponsored tiger gets treated / then care of. Our Montessori children are given opportunities everyday to become the best version of themselves and they’re becoming highly capable of making a difference in the world, and technology offers one avenue to do so in a positive way. The digital world offer new and quite different opportunities for their generations. As Montessori guides we aim to cultivate children’s critical thinking. These skills must now extend well beyond the classroom and into cyberspace. Therefore, we must prepare the child to face his social and emotional skills he’s going to need for living, adapting in this complex digital world also. As a result of this preparation, we hope they will become peace building collaborating empathetic adults. Time in the Black Bears’ cave flew by this October. The season is changing and with this comes plans for new lessons that have us enjoy the outdoors. The children have shown readiness for going out and a great interest in many areas of study: geography, biographies, topographical maps and flag work and mathematic work with big numbers. We are excited about the coming cooler months of outdoor activity. This month we were blessed to receive a new member to the clan. The children are getting to be leaders/guides to our new cub and taking on seamlessly this new responsibility. I have had the opportunity to represent lessons that were given at the beginning of the year and see the children witness the lessons through new eyes and demonstrate to their own surprise more understanding. I love how the kiddos are able to express deeper connection to their work in such a short period of time. It demonstrates how Cosmic Education is perfectly interrelated and designed for cross curriculum learning. It was lovely sharing with all of you at our social this month. The food was delicious and the company was fun and lively. Thank you for playing with us the Being With exercise. I hope you are practicing it at home. Thank you for partnering with me in the development of these amazing humans to their unlimited fullest potential. I look forward to our conferences and in class visits coming up in the next weeks. Once past gross its fun! Celebrating by making a Congratulation Card! Engineering in collaboration. Gaining perseverance by testing through trail and error. New ways to display what you learn and love to do. First step into inquiry and discovery. Read, write about it, test it. Erupt a Volcano! Learning how a plant makes its own food. Collaborative learning and task checking is a jump start to managing self and others. Linear view of the progress of mankind. Rich source of conversation and discovery. How fascinating can Science be when you find it everywhere. Watching bubbles and asking why? A time to take the big picture in and at the same time to witness the parts. Weeks of study brings deep understanding of what is in view. A way to bring practical life in partnership by teaching each other. A way to bring to the child a love for Language for the sake of its beauty. Children are acclimating after fall-break by going back to their individual and group work. It is exciting to see different types of projects that are taking place in the Coyote community. Some of these projects are child inspired while others came in the form of a Follow-Up work. As we’re getting closer to our parent conference and observations, the children are getting excited and waiting in anticipation to show their work to the parents. There’s a buzz going in the classroom with poetry reciting. While some children are memorizing various styles of poems, another group is writing their own poems to recite. We’re also seeing emerging of translating poems from English to Hieroglyphics. As we’re heading towards cooler weather, the children have started using the outdoor environments to have snack, work on follow-up work and to stretch and do yoga. The cooler weather has given us the opportunity to garden and with the help of parent volunteer and passionate group of children, we are excited to see how our Fall Garden will flourish! It was wonderful to see all of you who were able to make it to our fall classroom social. Parents who were not here, we missed you and hope to see you during our spring social 2019. A special thanks to our classroom moms who put together this event. It was such a pleasure to talk to most of you and have few laughters. Thank you again for the continuing support and I look forward to seeing each one of you soon! 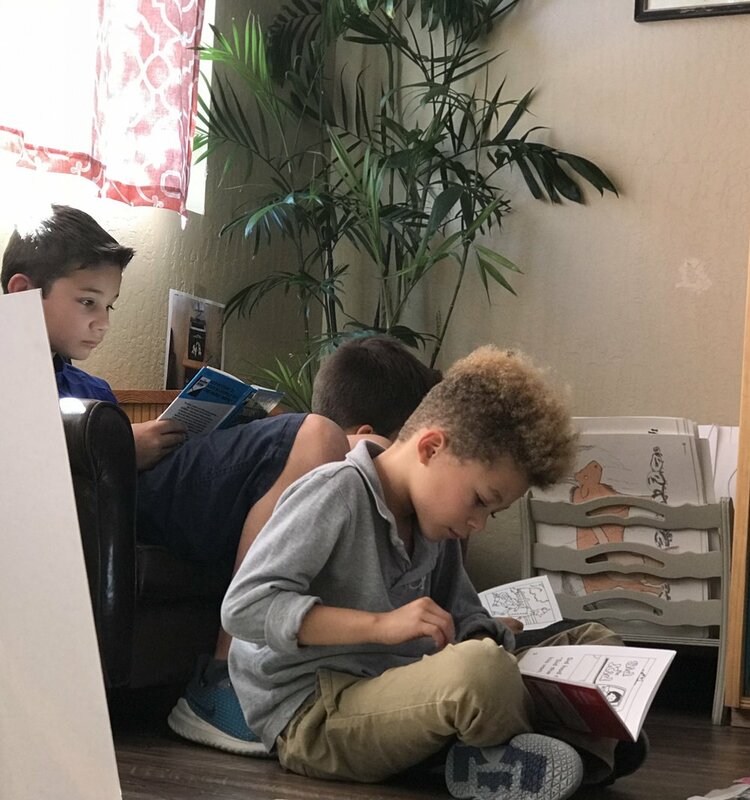 During this dedicated 20-30 minutes, the children are finding cozy places to read their chapter books. These children are finding the value of larger squares by using a multiplication board. Children write their own poems and recite in front on a group. This child is carefully cutting the carrots so our Bearded Dragon can enjoy her meal. Children memorize their favorite poems and reciting them to the group. Using reading cards, this child is practicing her reading and memorization of spelling. Using the grammar boxes, which includes actions, children are getting the opportunity to deepen their understanding of each part of speech. Using the Large Bead Frame, this child is working on his dynamic addition. Creating a scroll after after writing the population for each state, a brief history for each State, each States’ mammal. This child is using the dictionary to find the meaning behind the word while getting a grasp to what part of speech a word belongs to. These children are exploring how a conjunction can connect two separate sentences into one large sentence. These children putting the final touches to the cookies they baked for their friends birthday. These children are exploring due to the Earths rotation we get different time zones. 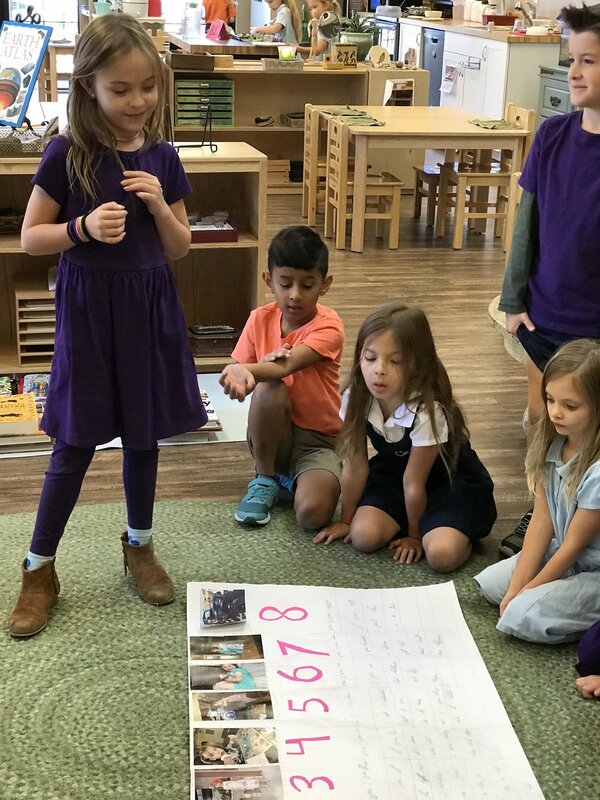 This child is telling her journey to a group of friends as she explain a memory from each year she decided to put down on her timeline. Stomata! This experiments is showing the children how the plants give out oxygen into the atmosphere. Children find it pleasurable to make their friends birthday extra special by baking goodies for them. By looking at the current time in Gilbert, these children are finding the current time in other parts of the world. After the fall break the students dove into their works with new energy. Every day they practice spelling using their individual spelling journals (lists) that are meaningful for each student as they put in their lists the words that they use and misspell in their writing. Many of them are commenting that their spelling is improving and they make less corrections now. Another area of improvement is students’ work with speed tests where they are working on development of they calculation speed and memory capacity. They are very proud to see how with each iteration they become faster and faster. Some of them even noticed that the focus on work is the key, that is what makes them faster. The researches that were started in the first quarter moved through many processes of revision and drafting and are on a steady course to completion. Sea Lilies and Hamster research are on the last steps of refining and presentation practicing. Cooling weather allows us to start with the biology experiments and learn more about plants. Some students are learning and experimenting how the roots find water, keep soil in place, and plants steady. Another group of students researching movements of air in the atmosphere during different seasons of the year. And another group is researching on plate tectonics learning how the crust is made of different plates, how they interact with each other, and change their positions in time. They will finish their work with baking continents and will have an opportunity to make jigsaw puzzles with them. The children are excited to start their research on board games and make their own boards for them. There were already leaders elected, roles and responsibilities chosen, plans made. Work is boiling. Our social this month was a lot of fun! The children had a good busy time carving pumpkins. I hope that they will survive to Halloween. Thank you very much for this joyful experience to the classroom moms who were able to organize such an amazing social. Writing in the journal helps students to reflect on the time they spend in activities during the day, things they learn, and plan their works. By manipulating the common fractions material learn the process of addition and subtraction of common fractions with same denominators. 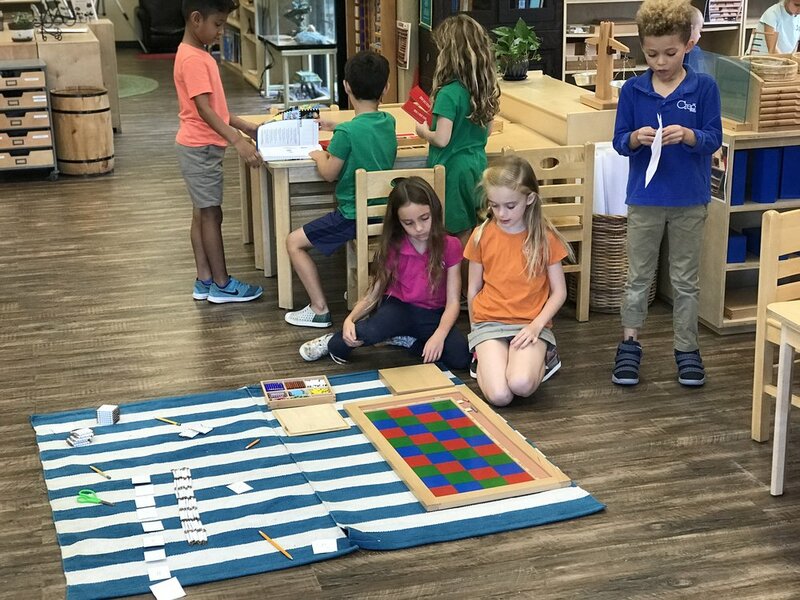 Students learn relationships between the number of digits in a number and its square root by manipulating colored hierarchical pegs and geometric patterns of guide squares. Students research fundamental needs of an animal for the classroom to find out the best way to accommodate the new pet in the classroom. 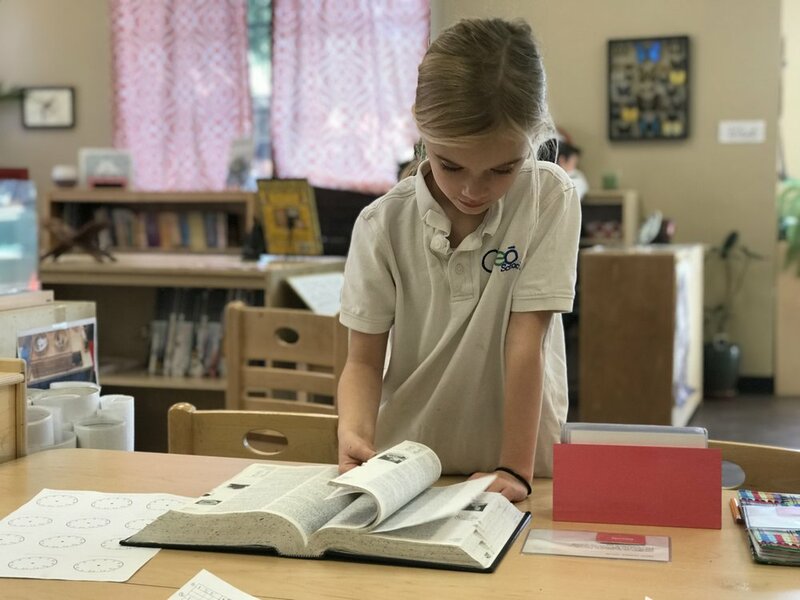 Students go through different stages of drafting the information that they explored in different sources to prepare visual aids to present their information to the classmates. 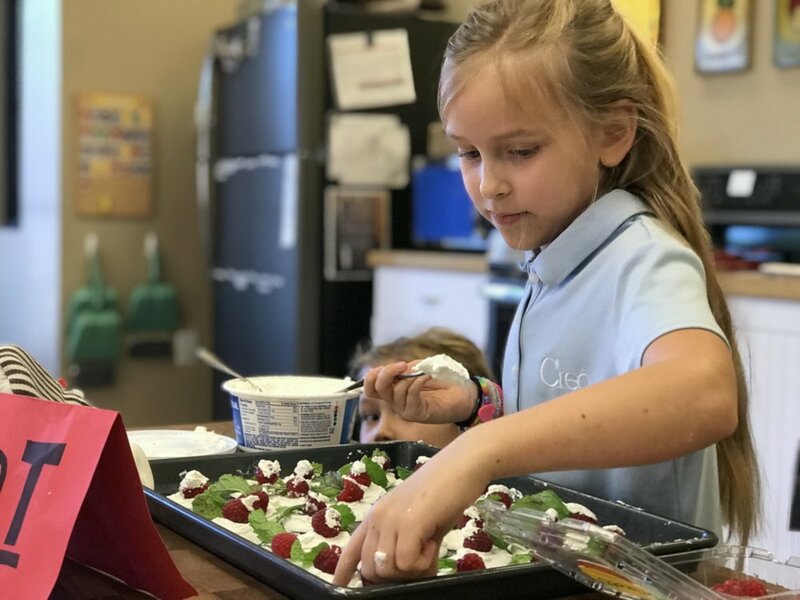 Baking is a real life group activity that utilizes all the knowledge and skills children learn in school to prepare a delicious treat for their classmates. Students quiz each other every day using individual spelling lists of words that each student uses in their writing every day. That helps them to make less mistakes when they write. Students learn how different animals of vertebrate classes differ or match by looking into different characteristics like digestion, respiration, movement, protection, etc. Students learn about the concept of an angle, variety of angles, and then write their own definitions. Students by looking into the classroom books research the change in directions of winds depending on the seasons of the year. Every day students practice math facts of all four operations working on improving their calculation speed. Utilizing manipulative materials students learn about 3 degrees of adjectives: positive, comparative, superlative; and how the spelling changes in each of the degrees.